Mushrooms are the cutting edge of everything today. Archaeology, pharmacology, nutrition, agriculture, financial opportunity and healing are all taking very serious new and old looks to our little animal friends. Mycellium is an animal just like you and me but just blooms when it gets happy and makes mushroom flowers. Mushrooms are the flower of an animal. Mycellium breathes oxygen and gives of carbon dioxide just like you and me. They fix nitrogen and build protein where as plants build carbon chains and have cell walls. Mushroom spores have been found in meteorites and are thought to have come here as star dust from afar. Their first cousins are the sponges and the sea corals who are animals, as well. It seems that they grew on to the land and formed massive underground networks that digest whatever consumable matrix it seems to grow into or it's spores land in. While we were busy developing skin and light sensitive eyes, our little cousins were just as busy developing their immune systems. Where we have T cells they have hundreds of immune cell types which arise when mycellium colonies encounter each other. They go to a sort of war where each makes toxic cells that attack the other while the other is countering those chemicals and making attack cells of its own. Soon each mycellium colony is making hundreds of attack and counter attack immune type cells. Many colonies can come together at once. These colonies live in many unusual places but their best homes are old growth forest and ancient undisturbed deserts. Super much is being learned everyday in many different fields. It is now being projected that after the Mini Dreyfus or last ice age that when our ancestors wandered up into Europe they found Neanderthals eating mushrooms, living in huge mushrooms (amadou), wearing them (amadou) and became at some point, the secret of fire. Hitler had no interest in antibiotics while the US was madly making and developing them. The Germans were looking to their past to the ancient mushroom people's oyster mushrooms. These had no allergic reaction, needed no refrigeration, were more stable over time and healed more types of infection. Bayer, Hitler's drug company, suppressed that knowledge as they came to the US, all totally free, and started the US drug culture. Many diseases are proving to be most easily and effectively treated through mushrooms. Most are specific for specific issues, internal and external. Much is happening everywhere but most definitely mushrooms should be happening at your space. Healing dinners are easy to grow. One can grow mushrooms of many varieties most anywhere very very cheaply. Compost, coffee grounds and logs are very common. Wood chips, leaves, around your fruit trees or in your garden rows are popular. Big today are new toilet paper rolls and super compressed saw dust or wood chip to make blocks that just bloom like crazy. Very much on the internet today with new websites and new producers being born everyday. Great garage or back yard project.especially for us older dykes who stand to benefit most from totally fresh 'shrooms. For beginners, I recommend, in summer, the Pink Oysters raised on straw in plastic bags. PoHu oysters mushrooms are aggressive and easy on straw in the fall. Italian gray and arctic whites are super beautiful and one should raise them once for the thrill. They are good mid temperature varieties that grow well on unusual compost and debre. The blue oyster mushroom are good in colder weather. Also, it's a huge thrill when you cook them the first time. Swamp Dance has held a mushroom festival for 5 years where we give away turkey tail mushroom tea and many of our vendors sell fresh picked mushroom products. Numerous people reacted every year with telling us something just got healed. We tell them the effect will wear off in 3 days if they don't continue use. Especially cancer and the skin problem folk. This cool women, Bubbles, makes soaps, lotions and scrubs from shiitakes and oysters that she lets folks sample and WOW! Swamp Dance has made a recipe book of basic food, soaps, lotions, potions, salves, scrubs, packs and enemas recipes. It is all on line or available to buy as nice spiral recipe book. 1. 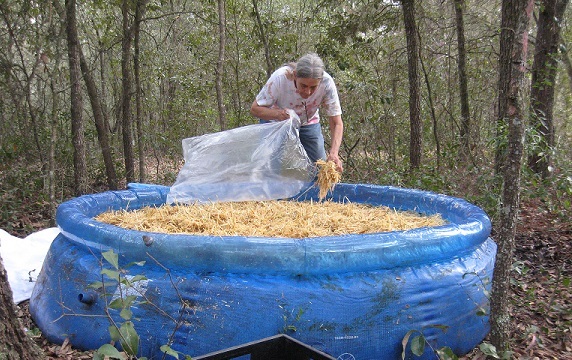 Place clean STRAW bale in water for 24 hours. Boil the straw if possible. I use old iron bath tube (used $15) on block with wood. Straw is $11 for compressed wrapped bale at Tractor Supply. 2. Add cup of agricultural lime (High Yield brand) if you like. Balances pH and helps with contamination. About $6 for whole big bag. 3. Whole bale method. Mix one loaf of oyster mushroom spawn per bale and mix thoroughly. Spread out in plastic sterile (bleached) baby swimming pool or something like that and cover with new or bleached tarp. Weight down tarp. Put baby pool on concrete or soil or sand ~ whatever maintains the heat the way you need. One cam just line a box with plastic. I like round pools for easy picking. Small $10. Large $22. At Dollar General Store. 4. Batch Method. Stuff in clear plastic bags very firmly with straw/spawn mixing as you go. We put clear bag in milk crate and pack/mix as you stuff but not extremely tightly. Tie up bag air tight and leave in milk crate (stacks well) or hang bags in shaded tree area. Must be very shaded by not totally. Box of 20 bags is $6. Small bag of spawn is $24. Large bag of spawn is $48. Plus shipping. 5. Check on every once in a while for bug or rodent damage/holes in bags. 7. Tear hole in these places where you see the dots starting. 8. Help shrooms grow outta these holes carefully ~ they form large clusters! Many will just push through bags and make their own holes. Use thin cheap bags. If you use very thick nice mushroom growing bags, one must tear the whole. 9. 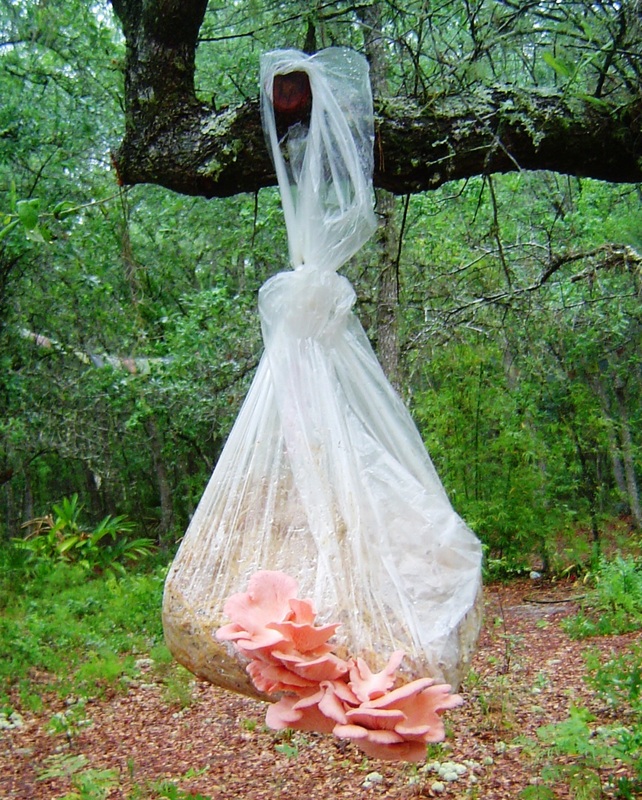 Shrooms will come in Flushes ~ happen about every 3 weeks depending on temperature and variety. 10. Change bag each flush and add alittle bottled or sterile or tap water that has set for 24 hours. Boil well water. Add water at room temp. You don't have to change bag but will last longer and less contamination. 11. Watch for sun moving and bags/pool/box getting in sun. 12. Use spent straw as excellent compost. 13. Feel free to contact me or check www.pmhigh.com We get our spawn from Field and Forrest, check http://www.fieldforest.net/ for alot more info. Contact me at pmhigh@yahoo.com or 386-546-6554.